That's right, simply fill in our entry form and we will Scratch one of our great Portrait Scratch Cards for you. We will then let you know which of our 5 great portrait prizes you have won. Good Luck - remember everyone is a winner! Only one scratch card per person per 12 month period. The scratch card prize can not be used in conjunction with any other prize or promotion or offer or voucher. The scratch card and its prize has no monetary value. We will contact you within 7 days to let you know the prize you have won. Any Problems Or To Discuss Your Scratch Card Entry or Prize Please Contact The Studio Directly. 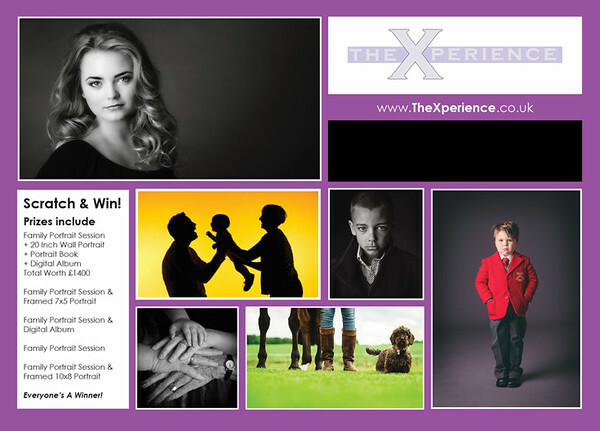 The Scratch Card Competition is being run in conjunction with TheXperience Group of Photographers.